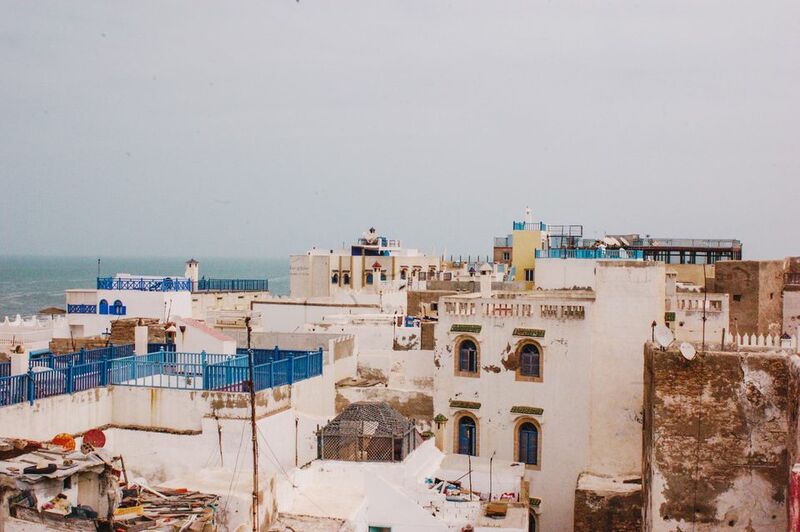 Essaouira, Morocco, is a laid-back coastal town that offers travelers a nice break from the hubbub of Marrakech which is just a few hours away. Visitors to Essaouira are attracted to its beaches, fresh seafood, and medina. Essaouira's biggest attraction may be its relaxing atmosphere. It's not a big town, and being a beach place it has a holiday feel about it. Essaouira is very much a working port and a fishing town. If the medinas of Marrakech or Fes overwhelmed you, you'll enjoy a more relaxed shopping experience in Essaouira (but not necessarily better prices). The medina is surrounded by walls and there are 5 main gates you can navigate by. The medina is free of cars and it's also quite clean. The souqs (bazaars) are easy to navigate and you don't have to worry about getting lost. They are located around the junction between Rue Mohammed Zerktouni and Rue Mohammed el-Qory (just ask a local shopkeeper when you're there to point you in the right direction). Basically, it is a relatively small area and you can explore at your own pace and walk down any narrow alley that looks interesting to you. The only place to avoid is the Mellah area of the medina at night. Essaouira's medina is walled like many old towns in Morocco and the ramparts are quite impressive as they're built on the cliffs. Locals and visitors alike enjoy strolling along the ramparts as the sun sets. The port is a busy port filled with fishing boats. A large fish auction is held every Saturday but watching the daily catch being sold every afternoon to restaurants around the harbor area, is fun to experience as well. Essaouira is on the Atlantic coast and the water is pretty cold; it's also quite windy. Not ideal for swimming or sunbathing but fun for surfing, windsurfing, or kite surfing (very cool to watch, even if you don't dare to participate yourself). The beach is also nice for a stroll and since it runs for about 6 miles (10 km) there's plenty of it. Locals use the beach to play soccer and other sports as well as paddling in the summer. Essaouira doesn't necessarily have the best hammams, but again, if the larger affairs in the cities didn't tempt you, this is a good place to try a traditional Moroccan steam bath. The sexes don't mix obviously, so this is a really great way to meet some local Moroccan women (if you're a woman). Opt for a scrub down with traditional black soap, it's really a treat. You might also consider the Hammam de la Kasbah (women-only) and the Hammam Mounia. The Gnaoua World Music Festival is held for 3 days, every June, and is Essaouira's biggest annual event. The Gnaoua people are descendants of slaves originating from Black Africa who established brotherhoods throughout Morocco. They are made up of master musicians (maalem), metal castanet players, clairvoyants, mediums, and their followers. This festival showcases their talents as well as that of international musicians who have embraced this form of music and mysticism. Hotels should be booked well in advance of the festival. Most people get to Essaouira by bus since there is no train station. There is a direct daily bus traveling from Casablanca to Essaouira which takes about 6 hours. Buses from Marrakech take around 2.5 hours and several companies travel this route. The bus station at Bab Doukkala in Marrakech is where the buses leave from. CTM is Morocco's biggest and most reliable bus company, so check with their offices first about prices and availability. You can book your bus and train ticket simultaneously if you go with Supratours Bus Company. They leave Essaouira twice daily and take you directly to the Marrakech trains station in time to catch a train to Casablanca, Rabat, or Fes. Travelers have found that Grande Taxis will take them to Essaouira from the Marrakech airport (during the daytime only). Alternatively, you can get a taxi to the main bus station in Marrakech and then hop on a bus to Essaouira. You can walk around Essaouira for the most part, that's the charm of this town. Petit taxis are the best way to get from the bus station to your hotel (although they can't go into the Medina). You can rent bicycles and motorbikes in town as well (ask at the front desk of your hotel). Riads (traditional houses converted to small hotels) are my favorite places to stay anywhere in Morocco, and Essaouira has some very nice ones in its medina. Riads have been painstakingly renovated using local materials and you'll find lots of beautiful tile work, whitewashed walls, and traditional Moroccan decorations. Every room inside a Riad is unique. Riads are often hidden down quiet alleyways in the heart of the medina and you'll have to find someone to help you with your luggage since no cars can access the medina. Owners are always happy to help if you let them know when you will be arriving. Dar Liouba - A very friendly, homely Riad situated in a quiet district of the medina. There are 7 double rooms, a rooftop terrace, and a cozy patio and living room. Dar Emotion - Situated in the heart of the medina, the cozy and moderately priced Dar Emotion has 5 rooms available. There's a rooftop terrace for breakfast and a patio, living room, and dining room. Ryad Watier - A larger Riad with 10 suites as well as a lovely little garden, hammam, and massage rooms. You can enjoy breakfast on the rooftop with nice ocean views and settle down in the vast library for a quiet read. Traditional meals are prepared for you using local fresh ingredients. Madada Mogador - A spacious, stylish and very tastefully decorated hotel in a nouveau-Moroccan style. The ocean views from the rooftop terrace are exquisite since the hotel is built right behind the town's ramparts. Ocean Vagabond - Very close to the beach and the medina, the Ocean Vagabond offers a garden, swimming pool, hammam, and 14 well-appointed, unique rooms with a view. Baoussala - Is about a 10-minute drive from the town of Essaouira. This is a beautiful and tranquil hotel, perfect if you want to relax and get away from it all. The food gets rave reviews as does the friendly service. There are six suites, each uniquely decorated and quite spacious. Essaouira is a fishing town and you have to try the locally grilled sardines when you're visiting. Any restaurant along the harbor front offers daily fresh fish specials. Some of the best restaurants are hidden away in Riads in the medinas. Ask your hotel manager to help you find them. The Place Moulay Hassan on the edge of the port is an excellent spot for a drink and some cheap Moroccan food. Chez Sam at Essaouira's port has excellent fish and seafood as well as a great bar. You won't find too many local Moroccans here though. Riad le Grande Large gets more attention for its delicious traditional meals than its bedrooms. Dishes will usually be accompanied by traditional live music. Chez Georges is one of the more expensive restaurants in Essaouira, so if you're looking to splash out, this is a good option. Dining is al fresco, so bring something warm to wear. There's almost no rainfall in Essaouira from March to October, so that's probably the best time to go. At the end of June, the Gnaoua Music Festival is an excellent cultural event, but if you're not interested in it, then avoid this time to visit Essaouira because the town is absolutely packed with people. Summer months from July and August sees a steady stream of visitors as well as local Moroccans looking to escape the heat farther inland. Essaouira's temperatures don't get much above 80 degrees Fahrenheit (26 degrees Celsius) even during the summer because of the wind that blows year round. If you don't like to be among groups of tourists then May, June, and September would be a perfect time to visit Essaouira. Winters don't get too cold, the temperatures will usually creep up to 60 degrees Fahrenheit (15 degrees Celsius) during the day, much too cold to swim or sunbathe, but still nice to bargain hunt in the medina.